Sweet Kraut, page 221: Leave out step 4; it belongs in the recipe for Wine Kraut. Cornichons a Cru, page 97: In step 1, I now let the salted cucumbers stand only 3 to 5 hours. So much salt draws the water out of the cukes quickly. Pickles in Rice-Bran Mash, page 213: A substitution for the 1 1/2 cups koji is 1 cup beer. Add the 2 cups water, on the next line, whether or not you’re using koji. 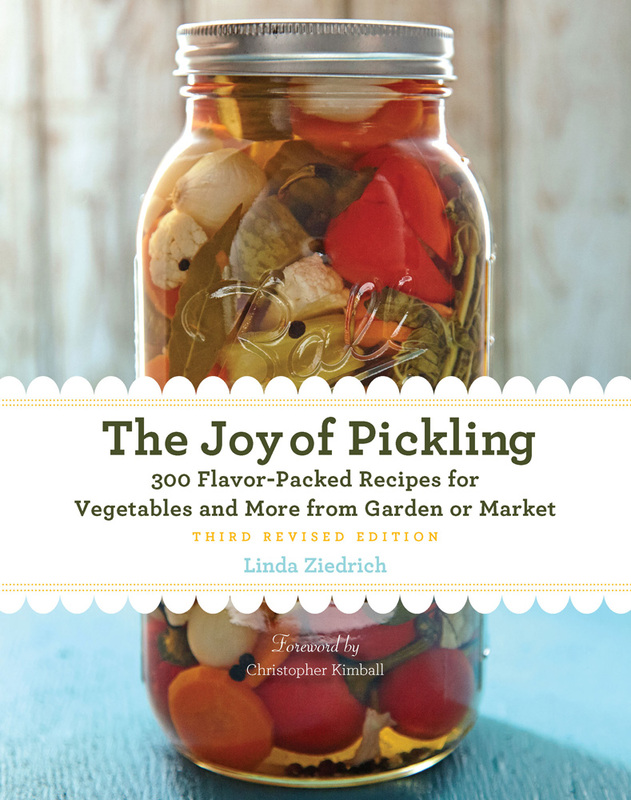 Quick Green Tomato Pickle, page 270: The onions, like the tomatoes, should be sliced 3/16 inch thick. Moroccan Pickled Beets, page 280: The salt is missing from this recipe! Add 1 1/2 teaspoons salt along with the sugar. Corn Relish, page 317: You won’t need 18 ears of corn for 2 quarts kernels unless the ears are quite small. If they are large, you’ll need only about 9. Apple Ketchup, page 353: A reader wondered if the applesauce in this recipe should be sweetened. No, it should not be. Also, cayenne is mentioned in the headnote but missing from the list of ingredients. Add 1/2 teaspoon along with the other spices–or more or less or none at all, as you prefer. Pickled Beef Tongue, pages 368 to 369: If you can’t get saltpeter, leave it out, and pour 1/2 cup cold water over the tongue. Also, I’ve found that 7 days’ curing is enough, and I prefer the mild saltiness that remains when I briefly boil and drain the tongue just three times instead of four. Spiced Blueberries, page 320: The yield should be 3 pints, not 2 to 2 1/2 pints. 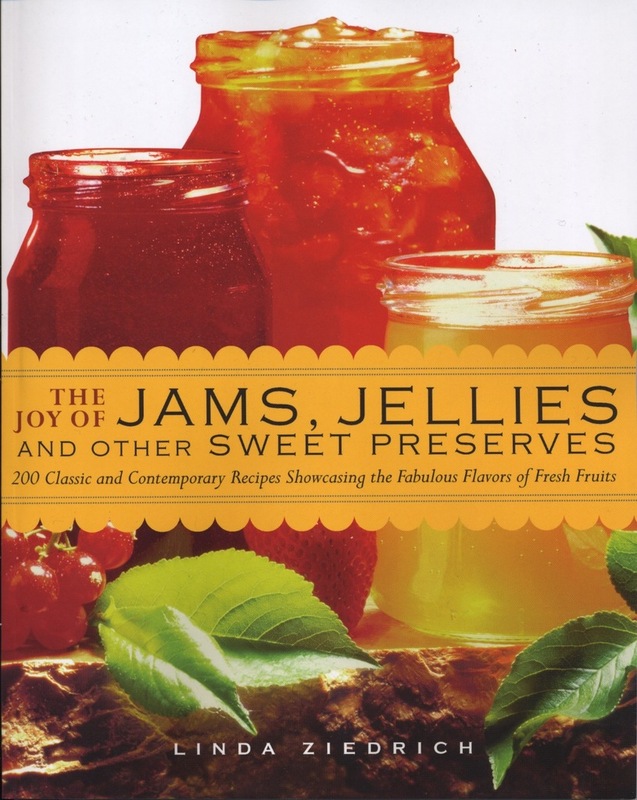 Chinese-Style Plum Sauce, pages 322-23: The peaches or nectarines and the plums should be pitted and coarsely chopped, not peeled and coarsely chopped. The bits of peel will be removed by the food mill, with which I use the medium disc, not the coarse one. Plum Chutney, page 328: The yield should be about 3 pints, not 2 pints. Tomato Ketchup, page 324: If you’re starting with fresh tomatoes, you’ll need about 13 pounds for this recipe. Banana Chutney: The yield should be about 3 pint 1/2 pints, not 6 1/2 pints. Cranberry Ketchup, page 349: The yield should be at least 2 pints, not 1 1/2 pints. Tomato Salsa, page 356: The volume of 2 pounds minced peppers is about 5 cups, not 2 quarts. Pickled Oysters, page 383: The yield for this recipe is about 3 cups, not about 6 cups. I store the oysters in a quart jar. Index, page 415: A missing listing is Sebiche (seviche), 389-90. Whoops! Sorry about that, Randal. Without undertaking a search for my original notes on this recipe, I’d say, yes, 1/2 teaspoon would be a good quantity of cayenne, depending on the heat of the pepper, or 1/4 teaspoon for those who like only a little heat. Last fall, by the way, I made a quince version of this recipe. Rather than including cayenne, I substituted fresh ripe Fresno peppers for half the weight of the onions. Instead of grinding the onions and peppers, I chopped them rather coarsely, and then I pureed the cooked mixture in a blender. The finished ketchup is delicious. For the Tomato Salsa, p. 356, are you supposed to peel the tomatoes before you squeeze them? No, Angela, there is no need to peel the tomatoes. And note that you would squeeze the tomatoes only if you wanted your salsa to be especially thick.